Keep the morning free for some bird watching at the Okhla Barrage. Afternoon sightseeing tour of Capital city of India, visiting India Gate, Qutab Minar & Humayun’s tomb and driving past the President's House. Overnight at the hotel. Take a train to Chandigarh (4 hr.) from Delhi in the morning and then transfer to Narkanda (6 hr.) stopping enroute for birding. Overnight at the hotel. Morning drive to Sangla (29,00m/ 6 hr.) through the breathtaking gorges of the Greater Himalayas. 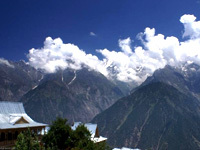 Enjoy a evening bird walk at Sangla. Overnight in tents. Drive leisurely towards Chitkul (2 hr.) stopping for birding enroute. Chitkul is the last inhabited village surrounded by green fields and high mountain peaks. Return to Sangla in the evening. Overnight in tents. Take bird walks around Sangla and fort Kamru. Overnight in tents. Drive to Sarahan (1,920m./4 hr.) a beautiful village surrounded by apple orchards and dominated by Srikhand Mahadev peak (5,155m). which resembles a Shivlinga and is famous for Bhimakali temple. Spend the Rest of the day bird watching and pay a visit to the Phesant Breeding Centre. Overnight at the hotel. Departure to Goshaini (8 hr., 3,000m) via Jalori pass & Shoja. Shoja, a small village at an altitude of over 8,000 feet. The access to Shoja winds through thick forests, alpine trees, which provide an untouched habitat. Arrival over here at the lunch hour; later on take a walk on the forest logging road into pristine Pheasant countryside. The Pheasants attractions seen here include Monal, Kaleej and Koklas. Continue back towards Goshaini. Overnight in a tourist lodge at Tirthan. 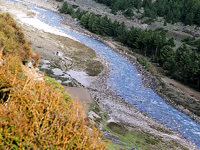 Morning bird walk towards the Great Himalayan National Park and afternoon downstream walk along river Tirthan. Overnight in a tourist lodge at Tirthan. Pay a day visit to Bahu and Jibhi for bird watching. Overnight in a tourist lodge at Tirthan. Drive to Bhunter (3 hr.) From Tirthan to catch a flight to Delhi in the morning. Arrive Delhi and transfer to the hotel. Morning bird watching at the Delhi Zoo. Spend the afternoon at leisure. Transfer to the airport for onward journey.